This ancient place of worship in Ruhuna is located on the bank of the Walawe Ganga, in the village of Udarata on the Nonagama-Ratnapura Road. It is about 12.8 km from Ambalantota. 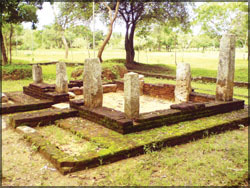 temple of the Maha Nagakula City where a large number of artifacts have been found during excavations. The Ramba Viharaya was the Royal Temple of the day. It was also the hide-out for King Vijayabahu I who arrived there in the year 1055, while he planned his war against the Cholas for 15 years. Sri Lanka was under the Chola rule for a period of 53 years. Vijayabahu had been canvassing among anti-Ramanna Desas such as Burma, Kalinga and Pandyan countries, to form an alliance against the Cholas. He effected three attacks to surround Polonnaruwa and defeated the Cholas. His son Wickramabahu continued to reign from there while Prince Parakramabahu continued with the tradition. These reasons have prompted historians and archaeologists to carry out their research into the area. They had found a large number of monuments scattered in a land area of 200 acres of dense jungle. 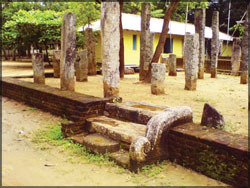 The Ramba Vihara had become the most important religious and academic centre of Ruhuna between the 10th and 12th centuries. Scholars of the time such as Rev. Piyadassi Thera and Rev. 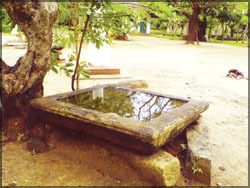 Mahanagasena Thera had lived here and in other temples around it. There had been an advanced civilization in the area. A large number of artifacts which had been found following research explorations conducted by scholars during the dry season had proved this fact. The venue itself is unique as there had been an ancient international harbour at Godawaya (there is evidence to support this fact). Traders had been in the habit of travelling from China to the Arab Seas and Sri Lanka had served as an ideal venue for entrepot trading (imports are re-exported) for which customs duties were collected. Inscriptions found at this venue during the 1st century AD have indicated that King Gajabahu was believed to have donated the funds collected as customs duty for the betterment of the temple. It is believed that it was from the mouth of the River Walawe that ships used to travel to Mahanagakula. A strange Buddha image made of white sandstone, had been found from the site during excavations. It had been refined and preserved. The image is different from what had been discovered from other sites as it had been hollow. When talking about the Ramba Vihara, one has to talk about the Manawulu Sandeshaya, a Pali poem which comprises about 30 stanzas. This is said to be a reply to a Buddhist priest from the Ramanna Desha by the name of Maha Kashyapa. He had sent a letter in Pali to the high priest of the Ramba Viharaya, inquiring about the activities in Sri Lanka. Pali about the Ramba Viharaya. It is under the Ramba (banana) trees that Samanera priests had been learning their religion. Due to this reason, the Ramba Vihara had also been referred to as Kehelgamuwa. During this period in the 11th century, ships had been arriving from Ramanna Deshaya (lower Burma) at the southern parts such as Godawaya. 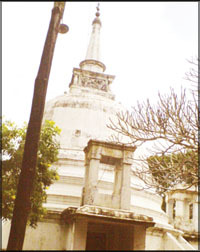 Maha Kappinna, had lived there. Though it had been a role model for a monastery at Maha Nagakula during the 11th and 12th centuries, now it is somewhat deserted. The writer, during a recent visit, found that restorations have not been done properly. The restoration of some of the artifacts were still under way. Hopefully, we will see a better restoration process in the future to protect this important place.